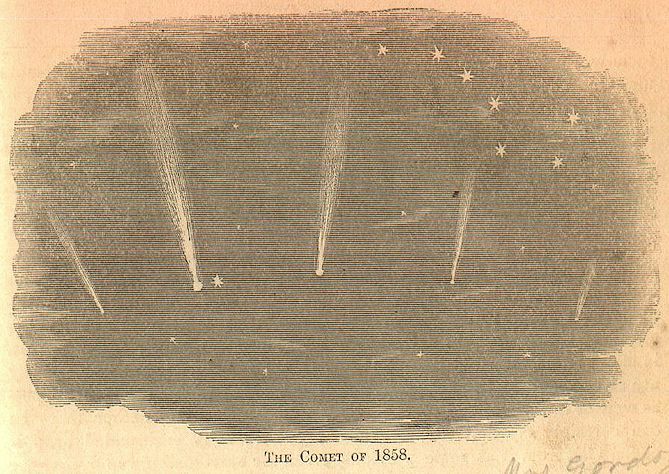 In 1858, Comet Donati made one of its extremely rare swings past Earth. While Forrester’s Playmate never names the great comet it is describing, it wasn’t the only children’s magazine to discuss or picture Donati. The Playmate, however, spends more time describing Comet Encke and theorizing on the nature of comets—something still being studied. We have had one or two gossips about our neighbors already. We have talked about the moon, our nearest neighbor, and about Mars, which is reckoned third in distance from us. We have become well acquainted with them. We see them often, and we know them well. But there has recently been a stranger on our premises, and I suppose we ought to notice him. He was first seen last June, coming towards us. His size increased as he came nearer, until, about the tenth of last month, he made a brilliant display, indeed. At that time his flaming tail reached nearly a quarter of the way across the firmament, and it was as bright as any exhibition of the aurora borealis I ever saw. You will all know what I mean, for you all saw the beautiful, wonderful sight. tacle we had to look upon for a few nights. Then it began to fade. Its tail, which had at first leaned towards the north, now turned a little towards the south, and finally it has disappeared from our view, and gone—we know not whither. It seems to be a very general opinion that this famous comet is a straggler; that it has never before been near us, and may never come again. it is certainly unlike any comet of which we have any record, in many respects. Yet these bodies are so eccentric in their appearance, as well as in their orbits, that no one can certainly say that we have not had a visit from it at some previous period—it may be a remote one—or that it may not come again in due time. Did you try to think what comets are, when you were looking at this one? Hundreds of these queer visitors have been observed from our earth, at one time or another. Some appear regularly once in a certain number of years. Encké’s comet comes every twelve hundred days, or about three and a quarter years; but it can only be seen with a telescope. One very curious fact in regard to this comet has been established conclusively—the time of its return to the point nearest the sun is constantly decreasing. In 1786 it was 1208 days; in 1805, 1207 days; in 1840, 1205 days; while in 1852 it was only 1204 days. It is a question among astronomers whether Encké’s comet will not finally be absorbed by the sun. Though over five hundred comets have been observed from our earth, no one as yet can tell what they are composed of—whether they are solid bodies, or only vaporous matter. None of them have ever been ascertained to be round, or of any definite shape. It is rendered quite probable that some of them possess no solid matter, but are masses of some transparent substances, we know not exactly what. Others are so surrounded by this apparently vaporous matter that it is impossible, by any means of observation which we possess, to discover whether there be any solid body enshrouded or not. Even the surrounding vapor, if vapor it be, changes constantly in appearance, sometimes two or three hundred fold in a day or two. I have mentioned the return of Encké’s comet every three years. It visits us oftener than any other. Some return in five, ten, fifty, a hundred years; others are supposed to appear more rarely still. One, in particular—that of 1780—is said to visit us only once in eight thousand years. I am a little puzzled to kno who made this discovery, for I cannot put much faith in its correctness. Yet it is true that some comets take long journeys from us, sometimes. Halley’s comet, for instance, comes once in seventy-five years, and is looked for with as much certainty and confidence at the end of that time as the rising of the sun. masses of light abut them; some have two or three tails, indeed more. The comet of 1759 had half a dozen tails, spread out like a fan. In the Playmate for August of last year, there is a picture of this comet. These tails seem to be similar to the light of the aurora borealis. They are transparent, and the stars beyond are plainly visible. The tail of the comet which has just left us was of great length. One night it waved, and flickered, and moved about like the waving light in the sky when the aurora is finest. I hope every reader will study this subject of comets. It is a great one, a noble one, and well worthy of all the thought you can bestow upon it.